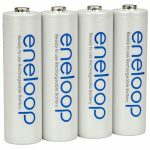 The most common type of rechargeable AA battery, and they’ve taken over from older, less efficient Ni-Cad batteries. NiMH batteries are inexpensive and often used in cheaper compact cameras, flashguns, battery grips and LED lights. Standard rechargeable battery type for digital cameras. Lithium ion batteries have good capacity, supply a constant output from fully charged until drained and have none of the ‘memory effects’ that affect other rechargeable battery types – you don’t have to wait until a lithium ion battery is flat before charging it again. These are used rarely in digital cameras (except in some cheap point and shoot models) but used extensively in external flashguns and battery grips. Alkaline AAs will do in an emergency, but rechargeable NiMH batteries are more cost effective and last longer between charges.